An allergy is an extreme reaction to stimuli from your environment such as pollen, dust mites, pets or something you ate or drank. The symptoms that go with this range of lung problems (shortness of breath and coughing), inflamed eyes and a runny nose to a blotchy itchy skin. For a short term allergy, a cure with Fexofenadine is often sufficient, but when it comes to chronic urticaria, you must use the drug for an extended period. Fexofenadine hydrochloride is prescribed by a doctor to adults and children over the age of 12. It depends on the dosage prescribed on how, and how often you should take this medication. Therefore, always read the label of Fexofenadine for the correct dosage, and how you should take this medication. Fexofenadine blocks the histamine release in the blood, thus reducing the symptoms of the allergy. The usual dose is one tablet per day. It is a good idea to take it at a fixed time. For example, in the morning when you get out of bed. This way you get the most benefit from the effect of Fexofenadine and you will also not forget to take it. It works within 1 hour and lasts for 24 hours. If you want to stop the use of Fexofenadine then you may do so at any time, but then you will run the risk that your symptoms return. Most side effects disappear after a few days. If that is not the case, talk to a doctor. Interaction between medications may be a problem. Make sure the doctor is aware of all the medications you are taking. Also mention the medications that you are taking without a prescription. 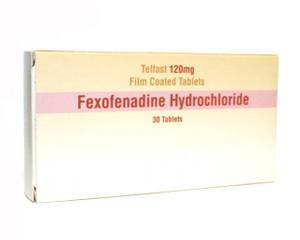 Fexofenadine is available in the variant Fexofenadine hydrochloride 120 mg 30 tablets. Store Fexofenadine below 30 º C in the original container in a dry place. Do not use this medicine after the expiration date.